My first ever trip to the Algarve has left me determined to return there. The Algarve is Portugal’s southernmost region and enjoys more sun each year than California (according to the Met Office). This beautiful coastal area is easy to reach from the UK, and I was there on a spring trip with my husband, while our teenage kids stayed at home, annoying each other. I’ve already written about the luxurious Vidamar Resort Hotel where we stayed and the excellent Ria Formosa guided bike tour which we went on. Here’s an overview of our four-day itinerary. After an early flight from London Gatwick, we arrived to blue skies and sunshine in Faro at 9am. 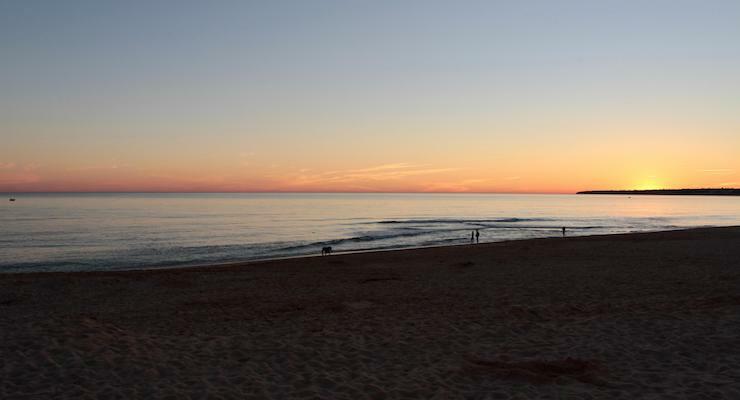 We picked up a hire car at the airport and drove 40 minutes along the coast to Vidamar Resort Hotel, which is close to Albufeira. The Vidamar is a large, modern, luxurious hotel which is right next to a golden sandy beach. You can read my full review and watch a brief video room tour here – but the short version is that we both enjoyed staying at the hotel and found it a very relaxing and welcoming place. 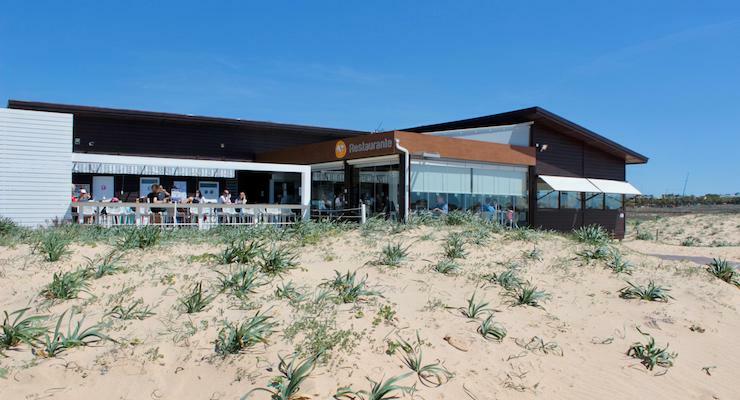 Once we’d checked in we walked along the board walk across the sand dunes to the beach, turning right to reach a nearby restaurant which we’d spotted from our room: Os Salgados. It was shorts and T-shirt weather, and we sat outside for a simple lunch in the sun. Toasties, tomato salad, chips, fizzy water, and a view of the deserted beach were just what we needed after our early start that day. We both liked the friendly atmosphere, the food and the location of Os Salgados, and decided that we’d go there for dinner one evening. 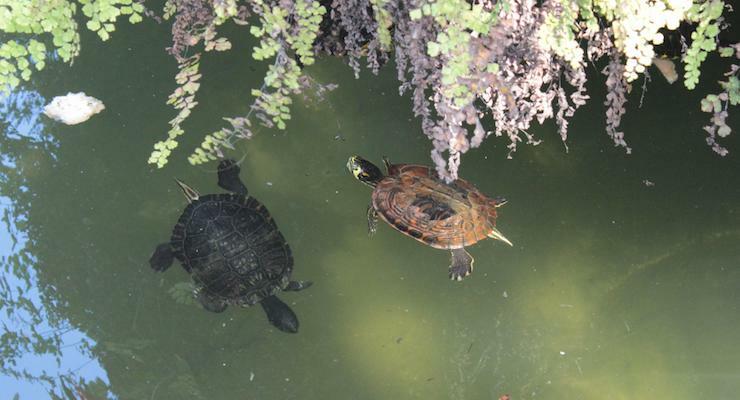 Back at the hotel we found some sun loungers by the enormous outdoor pool and snoozed and relaxed in the sun. We had dinner at the hotel’s spacious Ocean Buffet restaurant and then had an early night as we were tired from our journey. After an excellent breakfast at the Ocean Buffet we drove 20 minutes to Albufeira town centre to buy some water and to look around. We were only there for half an hour but my impression is that it’s a very touristy place and it isn’t somewhere that I’d choose to go back to. Next stop was Albufeira marina to join a Caves and Dolphins boat tour at midday. I was excited about the possibility of seeing dolphins in their natural habitat and was really looking forward to this experience. Unfortunately we didn’t spot any dolphins on our two-hour trip – but it was still very enjoyable and I’d recommend it. We sat at the front of the 12-seater RIB, the Insónia, and although it felt like we were going very fast (our skipper, Helder, said that our top speed during the tour was 25 knots – about 28 mph), astonishingly we didn’t get wet at all, not even a splash. 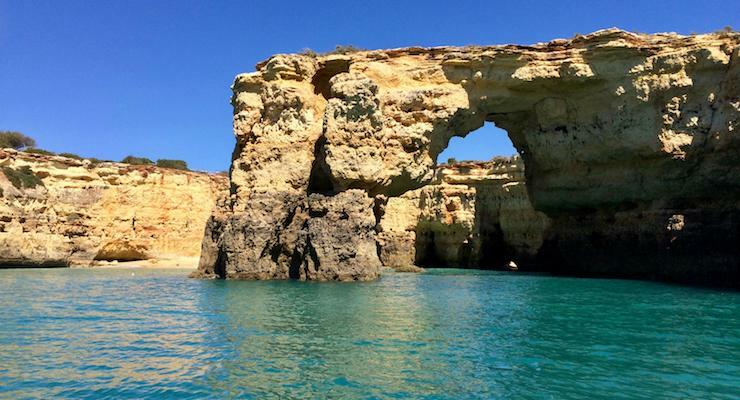 For the first hour of the tour we cruised along the rugged coast from Albufeira marina to Carvoeiro beach, looking at the caves, cliffs and amazing rock formations, occasionally edging slowly into a cave. Then we headed out to sea in a fruitless search for dolphins, before speeding back to the marina. Dream Wave run these tours all year round, up to five times a day in high season. It was reassuring to see that life jackets are mandatory for everyone on the tours. After the boat trip we drove 45 minutes west to Lagos. We parked in a car park under the main square and walked to the former Slave Market at the edge of the square. Built in 1444, this innocuous looking building must have seen untold misery and cruelty in its time, as it was apparently Europe’s first slave market. It doesn’t seem right that there’s a statue of Prince Henry the Navigator, one of the founders of the Atlantic slave trade, on the square outside the Slave Market. We went inside to see the very informative and poignant slavery exhibition and then explored the old town on foot. Dinner that evening was at the beachside restaurant where we’d had lunch the day before: Os Salgados. We’d skipped lunch and I found that I was very hungry, and I think that this is partly why everything that we ate that evening tasted absolutely delicious to me (although also the food was very good). As a starter I had goats cheese, melon jam and thin, toasted bread. The main course was grilled seabass with boiled garlic potatoes and tomato salad. Pudding was carob and almond cake with cream. It was all homemade using fresh, seasonal ingredients, and it was all excellent. As we ate we watched a beautiful red sunset over the sea. It was another beautifully sunny day and after an early breakfast at the hotel buffet we were ready for some cycling. João from MegaSport Travel was our guide for the day, and at 8.30 he picked us up from the hotel. João had three bikes on the roof of his car, and he drove us to tranquil Ria Formosa nature reserve for a half-day guided cycling tour. It was a fabulous experience and was probably my favourite part of the trip. You can read my full review in my post Ria Formosa Algarve bike tour. Back at the hotel we relaxed over lunch outside in the sun at the poolside bar. Then we sat by the pool, drinking mojitos. My legs were aching from cycling, and we decided to stay close to the hotel and eat at Os Salgados again as we’d enjoyed it so much the night before and we didn’t feel like driving anywhere to find a different place to eat.. While my virtuous husband went for an early morning run in the nature reserve by the hotel, I started packing. It was another sunny, warm day. 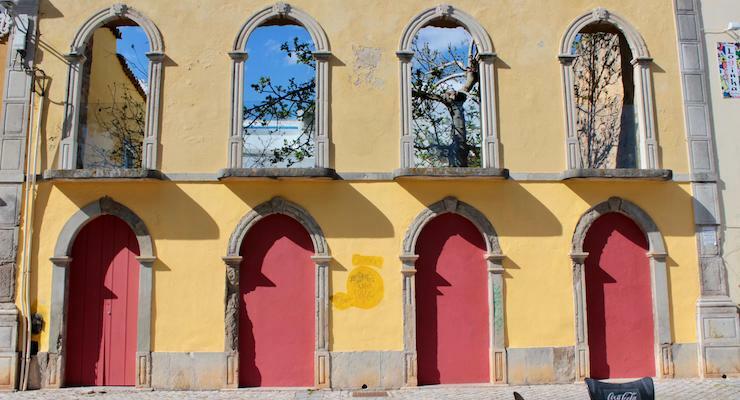 At 11am we checked out of the hotel and headed inland to Silves, a 25-minute drive away. We parked on the road at the edge of town and walked up through steep, cobbled streets to the Moorish castle. It was interesting to walk around and explore inside the castle walls. However, I found navigating the high walls without safety barriers a bit stressful – especially when I saw some children up there. Near to Silves castle there’s a small chapel for the Misericórdia of Silves which is definitely worth a look inside. It’s free to go in and has a display about the history and charitable work of this brotherhood, which was established in the fifteenth century in Lisbon. 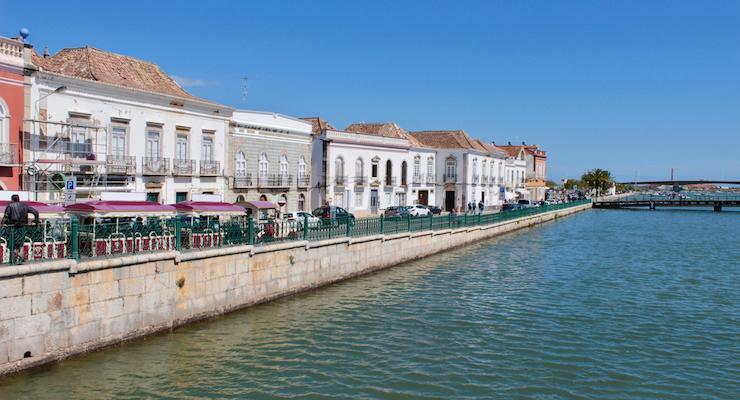 Our last stop before catching our flight home was the shabbily pretty town of Tavira, an hour’s drive from Silves. We parked by the river and walked through the historic town centre to the old market hall, which is now occupied by cafes and shops. It was the day before Good Friday, the town was busy with visitors, and unfortunately we couldn’t get a table at any of the decent looking restaurants in the market hall. We found a place for lunch just across the road, Oskar’s, which I wouldn’t recommend at all. We endured a very tough and definitely not fresh (although we’d been assured that it was) ‘Algarvian tuna’. This is probably a delicious dish if it’s cooked properly, with fresh ingredients – it’s grilled tuna with peppers, tomatoes and onions on top, served with fried potatoes. We needed something tasty and fresh to eat after this, and found just the thing when we spotted an artisan ice cream kiosk on a square by the river. Tangy orange ice cream did the trick, and I enjoyed eating that while watching goldfish and turtles swimming in the fountain nearby. 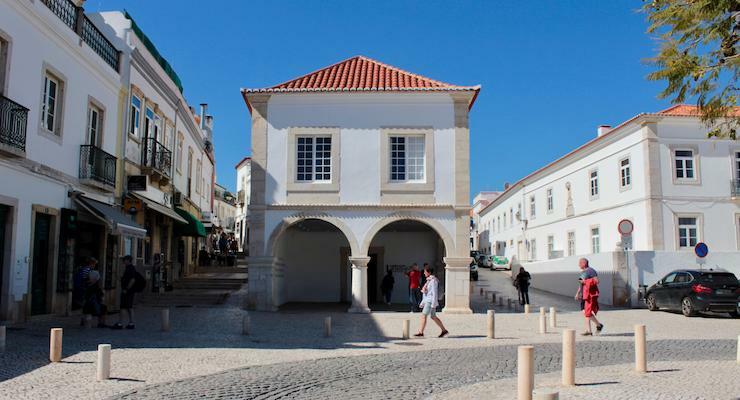 Everywhere that we walked in Tavira there was a gorgeous scent of orange blossom in the air. It’s a really pretty, genuine place, with a relaxed atmosphere, despite being busy when we were there. We sat on a bench to enjoy our last few minutes of sun before driving the 30 kms to Faro airport to drop off our hire car and catch our evening flight back to London. I really enjoyed our short trip to the Algarve, and it’s somewhere that I’d like to return to. Next time I’d like to go to Sagres, which is mainland Europe’s westernmost point, and also to explore more inland. 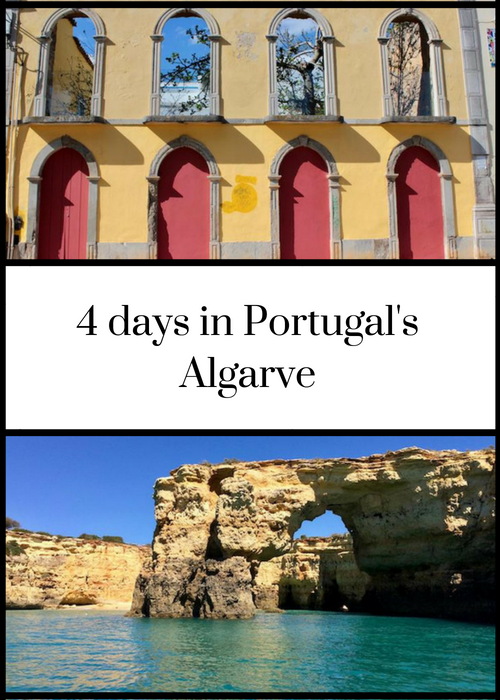 My husband says: ‘I loved the Algarve and would definitely go back to explore some more’. Dream Wave Caves and Dolphins boat tour: 35 euros per adult and 25 euros for under-10s (babies of 12 months old and younger aren’t allowed on the tours). 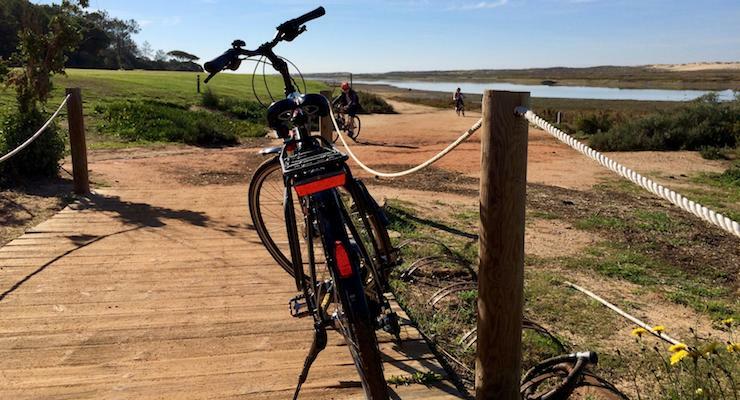 Half-day Ria Formosa guided cycle tour: 50 euros per person including hotel pick up and drop off, bike and helmet hire, and insurance, with MegaSport Travels. Entry to the Lagos Slave Museum: three euros per person. 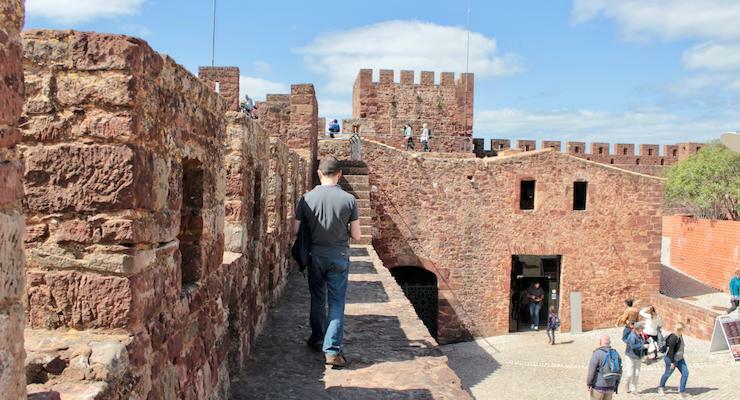 Entry to Silves Castle: two euros 50 per person. Our lunch at Os Salgados cost 22 euros. Our three-course dinner cost 95 euros, including a bottle of wine. We stayed at Vidamar Resort Hotel. We flew with Easyjet from London Gatwick to Faro. Our hire car was from AirAutos, whose office is a short bus ride from Faro airport. Disclosure: Thank you to Visit Algarve for helping to arrange our trip and providing a hire car. We were hosted at the hotel, on the boat trip and on the cycle tour for the purposes of this review. All opinions, words, images and misplaced dolphin excitement are mine.